Dog lovers so often possess an acute sensitivity to all living creatures. Spending time with dog owners at the 2016 National Dog Show on November 18-20, 2016 in Philadelphia, my awe of the dogs extended on out to their people. The great beauty and mystery of dogs comes to life in well told narratives of love. Our dogs light us up. My husband John, daughter Inga and I love connecting with friends and their beloved canines. This year's show was fabulous. We love the spirit of the show. Stationed next to the extraordinary therapy dogs, I had unsurpassed placement. Therapy dogs are beautiful in their peaceable intention. These dogs are healers. I loved painting 2015 Best in Show Skye Terrier Charlie with his handler Larry Cornelius for the National Dog Show official poster and program cover. I revel in the mystery of the fathomless depth of our dogs. In flicks of paint and line, one humbly captures mere indications of the evolution that took millions of years to culminate in the refinement, majesty and allure of each individual dog. This work was especially subtle. Dog portraiture is compelling. Painting Charlie, I wanted to capture some essence of the dog beneath that gorgeous coat of hair. Charlie is a Skye Terrier of such effortless grace that many predicted he would be the show's top dog in advance of the final judging. For reference, I used the magnificent photo of Charlie and Larry taken by Rhonda Cassidy, photographer par excellence (at mydoglovesrcphotos). The wisdom and observations of the stellar National Dog Show television announcers, David Frei, Mary Carillo and John O’Hurley, often stay with me. I love their reminder that the very best dog, as one sits and watches the show unfold on Thanksgiving afternoon, is the the family dog cuddling at your side. I was delighted that my posters were free of cost as a gesture of thanksgiving from the National Dog Show to all the people who love this show. My art was also utilized on the line of National Dog Show merchandise. Everything always looks beautiful! The Havanese (left) are breathtakingly beautiful. They run with grace. I love the stories of their deep love and loyalty. In 2015, we photographed many dear Havanese dogs at the National Dog Show. With such heart-stopping, best-of-breed reference, I had to do a piece of art! Due to requests, I am offering a giclee print of this art, 16x20 inches, $200 plus $25 shipping. The giclees are beautiful! If you would like to order a print, please email me at ChrisDuke@ChrisDukeArt.com. The painting English Setter Morey with Sisters (top right) was a challenge! I learned a lot in the process and am very happy with it. I drew many champion canines this year, but it is always a pleasure to draw a family pet like my dear little Lucy (bottom right) with her peccadilloes in full glory. While Lucy does not reflect the breed standard with her long legs and crossed eyes, she has our favorite Boston Terrier structure. She is an esteemed individual around New Hartford. The UPS and FedEx folk know her by name and the auto shop mechanics invite her into their shops. We prefer dining al fresco at establishments where Lucy is welcome and the wait staff greets her. She is such a great dog and friend. Because I illustrate THE PLAYERS Championship winner each year, I was on the edge of my seat once again as I watched the Sunday afternoon tournament in May 2016. I love so many of the golfers. Jason Day is a long-time favorite of mine because of his amazing life story, an epic adventure beginning in Beaudesert, Queensland, Australia. I love the international aspect of golf, and love to root for players who hail from across the planet in this finely mannered game. At the 2015 National Dog Show, the Lagotto Romangnolo Niko represented this magnificent and ancient breed now officially recognized by the American Kennel Club. The Lagotto breed entered the AKC register in 2015 in the sporting group. Meeting Niko and his owner, Tom Smyth, was a pinnacle of the show. I was honored that Tom commissioned me to paint his distinguished dog. Niko is incredible. One can discern Niko’s structure beneath his whorls of curls, something I took pains to capture. Niko is lovingly affectionate yet, wow, what a powerful and dignified stance. One can well imagine his fellow Lagotti as devoted truffle hunters, running through magnificent vistas of Italy (while wishing one was there, at their heels, following). Above are some preliminary sketches, sent to Tom, as well as the finished, framed piece of art. Odin won the best of his breed at the 2015 Westminster Dog Show, which is where I met him and his owner, Carla. Painting Carla’s daughter, Amanda, who is also Odin’s handler, with the beloved Odin was a highlight of the winter season. I photographed for the painting in Northville, Michigan in November 2015, and was mesmerized by the relationship between the two: an interspecies romance for sure. Odin is delighted to please Amanda, even when asked to sit tiresomely still for the “demanding” artist. One gets the feeling the esteemed dog complies all because she asked. Such dignity and grace. Painting over a span of weeks, one gets to contemplate one’s subject and Odin is one of dogdom’s best. The family will treasure their painting! 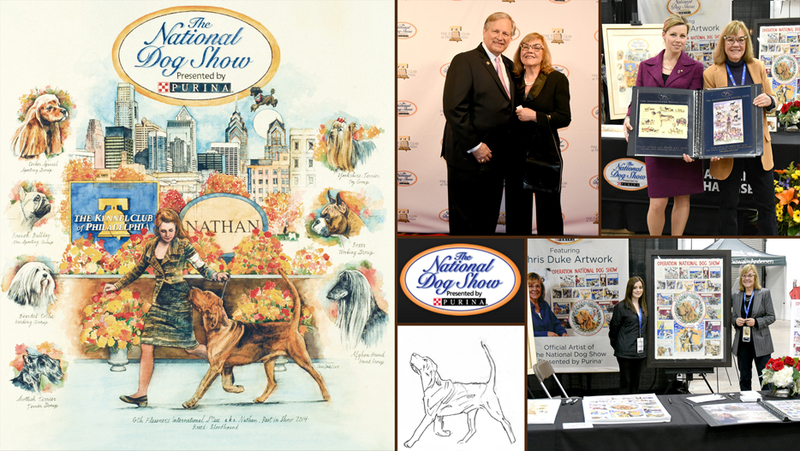 It was a thrill to be at the National Dog Show on November 14-15, 2015, signing my posters in a lovely display area (pictured bottom right) surrounded by some of my original works. I loved meeting the handler I had illustrated in the show’s official poster. In the top right image, I am with Angela Lloyd, a top professional handler of many dogs. Back at the Westminster Dog Show, I had illustrated Angela with the magnificent Scottish Deerhound Hickory, who was honored Best in Show. At top center, I am pictured with David Frei, the forever fascinating television announcer of the National Dog Show. Speaking with dog people at the show is sheer gift. Stories of a dog’s devotion are so often profound; dogs are healers. Through the conversations, I have come to feel an affinity for many more breeds than when I began drawing dogs, back when the strong and competent working group stole my heart. This year, I spent a lot of time with the Havanese breeders, finding myself in awe of the fluffy yet steely little characters. Dogs are unique; the individuality is what I love to capture when I draw. At the National Dog Show, the Lagotto Romangnolo, a breed newly recognized by the American Kennel Club, became one of my favorites. It is so fitting that this beautiful, ancient breed hails from Italy. The National Dog Show has a relaxed friendly ambience. I talked to people who have attended every show from the beginning and would not miss a year. For me, every year has a particular character, dependent on the particular grand dogs who participate. It will be an honor to record something of each show in my paintings as years go forward. I am delighted that this painting of Rickie Fowler joins my pantheon of paintings that honor all the winners of THE PLAYERS golf tournament in the beautiful gallery at Ponte Vedra, Florida. Included in my art of the champion, Rickie Fowler, are Sergio Garcia and Kevin Kissner, fellow stars of the magnificent Sunday-afternoon, three-hole aggregate score playoff. Every year's tournament is unique and unpredictable, due to all the steely golfers at the top of their game. They walk beautiful fairways as morning light turns to afternoon, then fades to evening sunset. When I think of summer, the perfection of Sawgrass fairways always come to mind. For art, the best of backdrops to the story of a weekend! 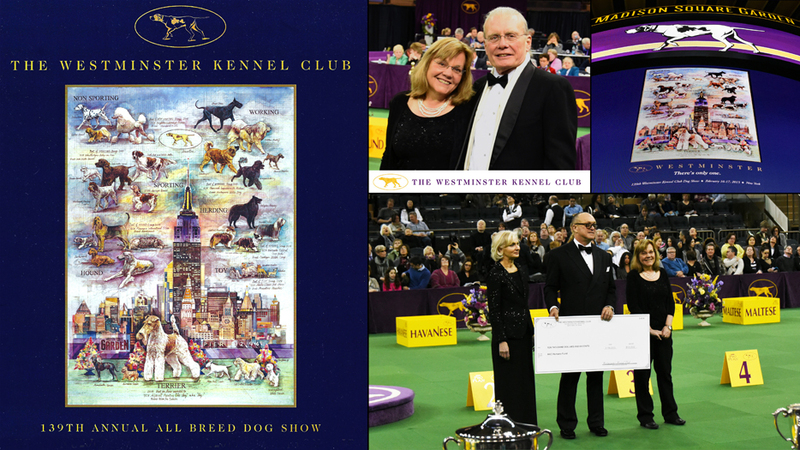 February found me back at the Annual Westminster Kennel Club Dog Show where my artwork, “I’ll Paint the Sky,” was featured on the official dog show poster. The painting depicts the 2014 Best in Show winner "Afterall, Painting the Sky" along with her fellow champions. On February 16, the first evening in the arena, I took part in the presentation of $10,000 by the Westminster Kennel Club to a canine charity. The money came from the poster proceeds. Worthy piece of art! I am delighted to have a new gallery affiliation with the River Road Gallery in Wilton, CT, and look forward to working with owner Roslyn Strivzer and gallery manager Pat Blossom. Their enthusiasm for the art they show is inspiring. I love this little gallery. 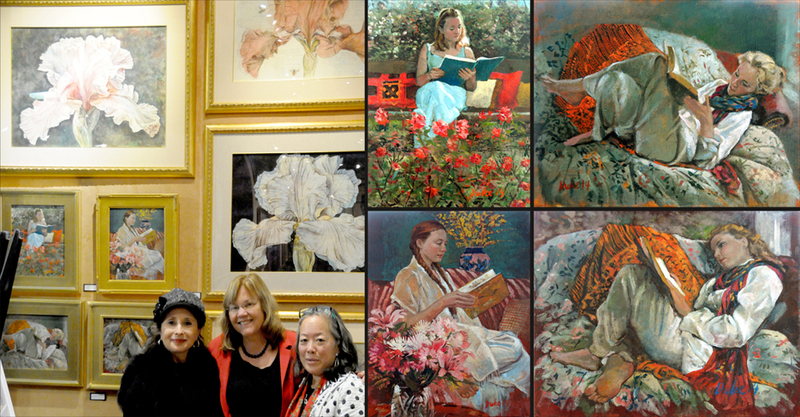 My paintings, including Woman with Orange Shawl I & II, Woman Reading in Rose Garden, Woman with Chrysanthemums, Iris in a Hushed World, Iris with Bees and Iris at Midnight, graced a gallery wall for the Christmas season. It is fascinating to paint people at repose, reading. One gets a feeling for the present humor of a model when studying her in the solitude of a private space. The attitude of a painting definitely shifts, be the subject perusing homework, flipping through the latest issue of VOGUE, or focusing on a gripping novel. Just how much is my projection, versus her unique sensibility of the moment, is a mystery. Painting people is relational. More of my paintings and art of flowers can be viewed at the links below. 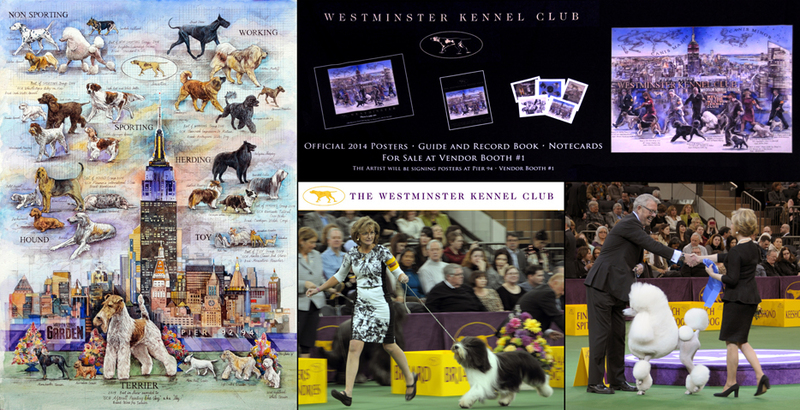 It is an honor to be the official artist of the 139th Annual Westminster Kennel Club Dog Show. This year my art, which I named “I’ll Paint the Sky,” depicts the 2014 Best in Show winner, a frisky Wire Fox Terrier named “Afterall, Painting the Sky.” She is surrounded on the stage by her fellow terriers, while up in the sky are friends from the other canine groups. My husband John and I look forward to being at the Dog Show on February 16-17, 2015, and hope you will come see us at the poster signing desk! We feel a special simpatico with our fellow dog lovers. To hear many profound Best Dog stories, the days are a privilege. It is meaningful to focus and reflect upon the mysterious and dear companions who share our homes. The Westminster art is always a challenge to design as it must incorporate many elements from the magnificent dogs to the Empire State Building, Madison Square Garden and Manhattan skyline. The illustrator part of me thrives on such challenges. For this painting I used a palette with predominant gold and purple, the emblematic colors of the show. Please see more of my art of dogs at the link below. Late summer 2014 found me happily drawing Martin Kaymer who won THE PLAYERS 2015 golf tournament. THE PLAYERS tournament, held at the beautiful Sawgrass Course in May, was exciting all the way to the finish. Every tournament is a story unfolding. At the 2014 PLAYERS Tournament, Jordan Spieth, the 20-year old from Texas, was a crowd favorite. Paired with Spieth, Kaymer found himself playing against impassioned crowd chants of "Go USA!" Spieth took the lead for a time until his first bogey of the tournament after 59 holes. By the end of Sunday, Spieth was in fourth place. Jim Furyk, who ultimately came in second, worked his way to a stroke behind Kaymer, after a double bogey near Sunday's finish. Due to a rain delay, the guys finished at near dark. I was delighted to see Kaymer finish at the top. My portrait of Kaymer will hang in the Sawgrass clubhouse gallery in Ponte Vedra, Florida, among my portraits of all THE PLAYERS winners. My other Professional Golfers Association (PGA) PLAYERS champion portraits can be seen at the link below. Teaching a watercolor class at the Beekley Library in New Hartford this summer has been terrific. Delighted at the level of talent in the class, I aimed to give thoughtful and specific feedback on painting well. We began with the oft-terrifying "busting the clean white surface of the paper," and continued all the way to the end game. For me, it was fascinating to watch highly individuated styles emerge. I can humbly say that I had a blast. I spent a pleasing morning at the Beekley Library in New Hartford, CT talking to children about illustrations I did for a series of American Girl books. Many of my original drawings were on display. I briefly explained the illustration process - finding people (usually friends and family) to model, rigging up costumes, improvising sets and props, taking hundreds of photos, and then integrating my best photo reference into the final art. My American Girl Summer in the City illustration was a perfect example. This complex scene (top center of image) shows a town square filled with all sorts of people engaged in separate activities - a bit like a page from Where’s Waldo? Later on, I did some drawings with the children. They eagerly depicted new age princesses – paragon women infused with high-tech features for increased strength and agility. Though they were quite young for professional pointers, I encouraged them to draw a wide range of subjects and keep practicing. I also encouraged their parents to use cardboard portfolios to keep these imaginative creations intact for years to come. You can see more of my book illustration at the link below. The end of a tournament is very tense for the armchair golfer. I was overjoyed that Tiger Woods won THE PLAYERS title again in 2013, and was delighted to paint him in the context of his second Sawgrass victory after having painted his 2001 triumph years before. In the rightmost image, Tiger has just unveiled his 2001 portrait in the Sawgrass clubhouse gallery in Ponte Vedra, Florida. The image of his head alone will be featured on one in a series of banners lining the road to the Sawgrass clubhouse. Tiger's red Sunday shirt is a gift to an artist who loves to paint color. For the 2013 art, I loved once again painting the iconic 17th hole. This treacherous island green, key to Tiger's brilliant 2001 victory, humbled Sergio Garcia in 2013 in the final Sunday round. In golf, much can hinge on a misplayed moment. Most golfers occasionally land themselves in a jam. It is fascinating how, on any given hole, some recover with a deft save while others simply can’t recoup from a poor swing. Sergio’s fumble was a heartbreak. However, the scene quickly changes and attention shifts. It was glorious to watch Tiger and his caddie celebrate. My other Professional Golfers Association (PGA) PLAYERS champion portraits, which I paint each year, can be seen at the link below. Four of my watercolor, pen and ink dog portraits – Cairn Terrier, Alex, Irish Setter, and Two Irish Setter Study – were accepted to the 28th Annual Art Show at the Dog Show, a national juried fine arts competition dedicated to canine art. The show was held from March 1 to April 7, 2014 in Wichita, Kansas. I am honored that the Cairn Terrier portrait won two awards. The Art Show at the Dog Show exhibit is featured at the prestigious Sunflower Cluster Dog Show at the Kansas Pavilions in early April. The largest canine art show in the country, it included over 180 works by artists from across the country and around the world. 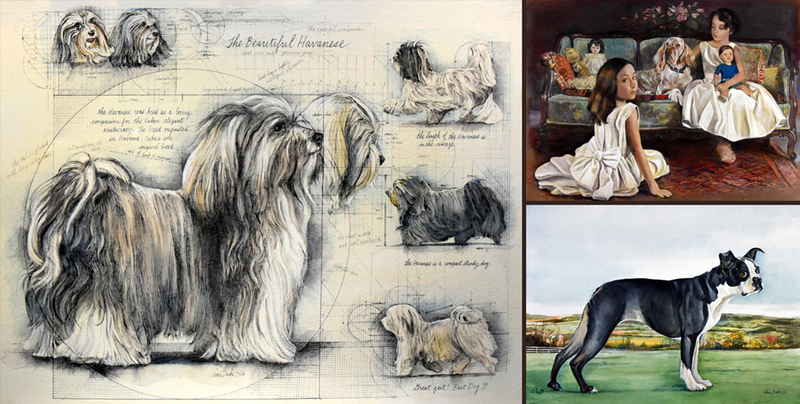 Proceeds from the sale of the art on display benefit the American Kennel Club Museum of the Dog in St. Louis, Missouri. More of my art of dogs is viewable at the link below. I had a wonderful time at the 2014 Westminster Dog Show where my painting Where the Stars Come Out was featured on the official dog show poster. I spent two fantastic days signing poster prints at Piers 92/94, the impressive venue for the dog benching and preliminary judging. My daughter Inga, who accompanied me to the show, was a great help as we met dog show attendees and participants, and I personalized dedications on the prints. We loved our conversations with everyone, especially all the stories of the extraordinary dogs in people's lives. My tireless husband John also attended the show, taking thousands of stunning photos. The posters sold out, which was a thrill. Proceeds from sales will benefit the American Kennel Club's Canine Health Foundation. After our days at the piers, we spent the evenings at Madison Square Garden, watching as the best of the seven canine groups were chosen, and then the distinguished Wire Fox Terrier GCH Afterall Painting The Sky was awarded the coveted Best in Show award. It was an honor to meet many of the people who participate with their magnificent dogs. More of my dog art is viewable at the link below. My painting Where the Stars Come Out, a lively watercolor, pen & ink work showing the 2013 Best in Show Group winners as they run with their handlers, was chosen as the winning artwork to represent the 138th Annual Westminster Kennel Club Dog Show. The piece also features the nighttime skyline of Manhattan as well as canine constellations Canis Major and Minor - the stellar dogs that watch over and illuminate the festivities at Westminster. This artwork will appear on the Westminster Dog Show’s official poster, guidebook, and other materials. When the show takes place on February 10-11, 2014, I will attend and sign and dedicate prints of the posters, which are sold at the event. 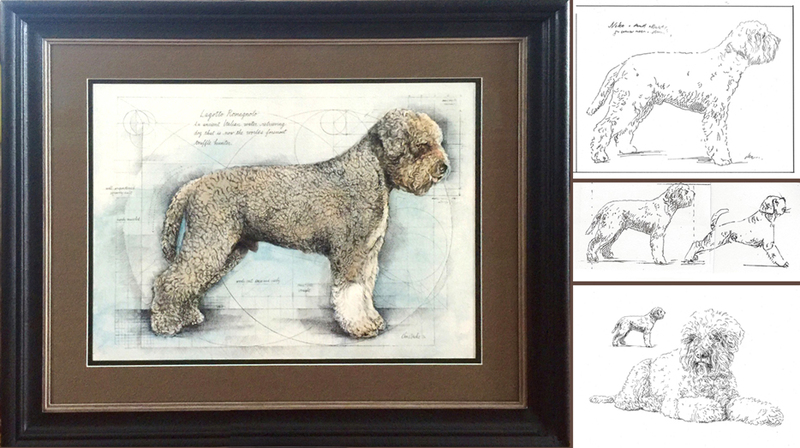 The original artwork, as well as proceeds from the poster sales, are donated to the American Kennel Club’s Canine Health Foundation. My art of Scottish Deerhound Hickory had been selected as the Westminster Dog Show poster art in 2012, and my piece Inside Westminster was a finalist in 2013. I am honored to be the official artist again, and I look forward to cheering on the canine superstars in February. Six of my portraits, five in oil and one in watercolor, pen and ink, were featured in an exhibition sponsored by the Oxford Cultural Arts Commission and the Connecticut Society of Portrait Artists (CSOPA). The show ran from October 2-29 at the town hall in Oxford, CT. Included in the show were (clockwise from top left) Jack Nicklaus, Cassie with Soccer Ball, Allie at Four, Tory Hart, Inga Reading - I, and Julia in White Gloves. More of my portraits in oil and watercolor, pen and ink can be seen at the links below. As a member of the Carriage Barn Arts Center in New Canaan, CT, I am pleased to be included in their 36th Annual Members’ Show. My painting Iris Explained is on display at the exhibit, which runs from September 16 until September 29, 2013. 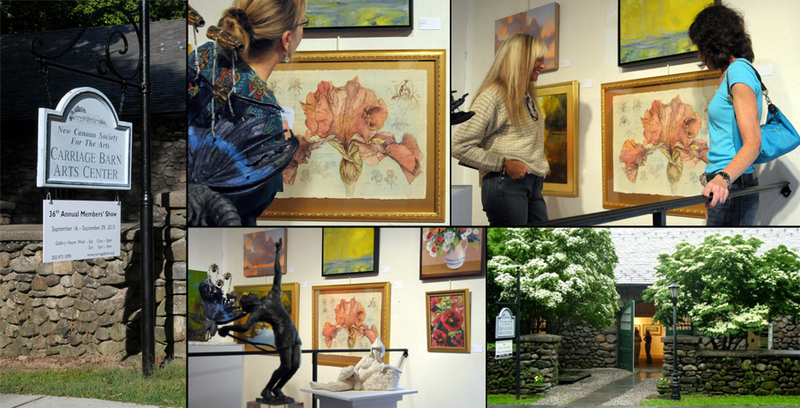 All of the art in the Members’ Show is finely showcased in the Betty Barker Gallery, an elegant loft-like space inside the 100-year-old Carriage Barn on the grounds of the former Waveny Estate in New Canaan. I photographed the September 15 opening reception on behalf of the arts center, and got many great pictures of visitors perusing the works of art. My iris painting looks good in the mix! More of my flower paintings can be seen at the link below. I was delighted to see my painting, Iris with Bees, hung in one of the most visible spaces at the New York Academy of Art Annual Summer Exhibition at the Allegra LaViola Gallery in New York City. One never knows where one's precious painting will land in a sea of exceptional art at an exhibition. The show runs from June 27 until July 27, 2013. At the opening night event, I was honored when one guest told me how my floral painting reminds him of the work of a well-known illustrator from the 1960s and 70s, Alan E. Cober. In my art of flowers, I have aimed to bring more playfulness into my work. Alan Cober, a very dear hero to me, always drew magnificently creative and lively pieces. Thus, I was thrilled at this comparison! More of my flower drawings are viewable at the link below. I donated this piece, Two Iris Study, to Homeward Trails for their annual PawCasso art auction in Washington, DC. The event was expertly organized, lively as well as moving, and an amazing success. Homeward Trails is a commendable animal rescue organization that is close to my heart. Based in Arlington, VA, the group brings together devoted volunteers to find homes for stray animals, animals in high-kill shelters, and animals whose owners can no longer care for them. Thanks to Homeward Trails’ large network of animal foster care providers and the funds it raises through events like PawCasso, many well-deserving dogs and cats land in permanent, loving homes. I am delighted that my iris art did very well in the auction. Three pieces of mine – Inga and Lucy, Daisy Dew, Muggles on Her Rug – were accepted to the 27th Annual Art Show at the Dog Show, a national juried fine arts competition dedicated to canine art. The show is held from March 1 to April 8, 2013 in Wichita, Kansas. The Art Show at the Dog Show exhibit is featured at the prestigious Sunflower Cluster Dog Show at the Kansas Pavilions in early April. The largest canine art show in the country, it includes over 200 works by artists from across the country. Proceeds from the sale of the art on display benefit the American Kennel Club Museum of the Dog in St. Louis, Missouri. My painting Inside Westminster was chosen as a finalist in the 2013 Westminster Dog Show poster competition. It was a great challenge composing this piece, which features the entire story of the Westminster Show, from gorgeous dogs being bathed, blow dried, and embellished with mascara, to the culminating runway performances. 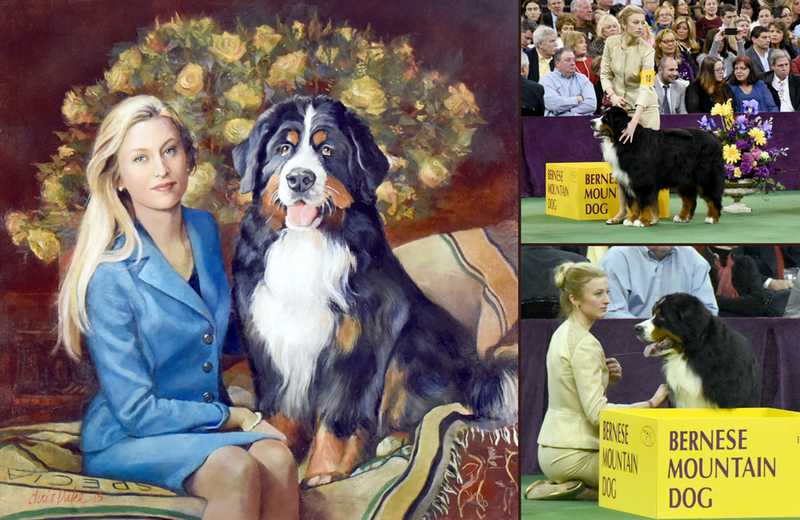 In the center, I painted the 2012 winners of the seven breed groups with their handlers on the show floor, as well as star Malachy, top dog of 2012. I loved being able to tell the exhilarating story of Westminster, start to finish. This piece was possible because my husband and I had terrific photographer seats at the Westminster Dog Show in 2012, when my artwork of Scottish Deerhound Hickory was featured on the official Westminster poster. Telephoto lens in hand, we took over a thousand pictures during the two-day event. Inside Westminster was on display at the 2013 dog show where many viewers were delighted to point out friends as well as themselves in the art. It was their real story. More of my art of dogs can be seen at the link below. In November and December 2012, a one-man show featuring my portraits of people and dogs is hanging in the modern and very elegant Burlington Library in Burlington, Connecticut. The librarians tell me that this show has been their most successful and best-loved ever. People linger and ask questions, and often choose a favorite portrait. It seems many people have owned and loved a Golden Retriever because my painting of Alex was very popular. For an artist who works on commission (and thus does not keep the original works), it can be a challenge to pull together fifty paintings. However, because I continuously experiment with new subjects and ideas, I am fortunate to have enough art on hand to assemble a show-worthy group of works. The subjects and styles are quite diverse and exploratory, which makes the show a lot of fun. My portraits of people and dogs can be seen at the links below. I was thrilled to see Matt Kuchar win THE PLAYERS golf tournament on May 13, 2012. For the PLAYERS champion portrait, which I do every year, my process is this: I begin with a pen sketch that depicts highlights of that year's tournament. After sketch approval, I do a large, solitary portrait of the winner, which will be the focal point of the final art. For Matt Kuchar’s portrait, I loved illustrating his vibrant smile; it seems to rise from the art. This was his expression at the moment he was awarded his trophy. Before I complete the portrait with vignettes and text, the Professional Golfers Association (PGA) photographs the solitary portrait to use for the banners that elegantly line the winding road approaching the clubhouse. Then, using my final portrait, the PGA prints beautiful posters that I number and sign. The golf champion receives autographed poster #1. Finally, my original art is framed and hung in the Sawgrass clubhouse gallery, shown here. I am delighted that Matt Kuchar continues to do very well on the PGA tour. I passionately root for winners of THE PLAYERS, all whom I have painted. I follow their golf careers well into the Senior Tour. My other PLAYERS portraits are viewable at the link below. It is rare that I do a piece as deeply meaningful to me as this painting of Grace Church, commissioned by the church as a farewell gift for the beloved departing priest, Doug Fisher. Over the decades, this is the third farewell painting I have done for Grace Church priests when they move on. At the farewell party, held at the Millbrook School on July 29, 2012, I got to present the art myself. Doug, now the Very Reverend Douglas Fisher, Bishop of Western Massachusetts, has this painting in his home where I hope it evokes good memories of the Millbrook years. He and his family touched the lives of many people. In this photo, Doug is on the far left in his Grace Church t-shirt. His wife, the Rev. Betsy Fisher, is sitting at his side. More of my art of architecture can be seen at the link below. Attending the Westminster Kennel Club Dog Show at Madison Square Garden in New York City was the highlight of the season for me. My art of the Scottish Deerhound Hickory, champion of the 2011 Dog Show, was the winning artwork chosen by the Westminster Kennel Club for the official 2012 Westminster Dog Show poster, the official dog show guidebook, and other materials. The poster was well loved. As I signed copies throughout the two-day show, the line often snaked around the display tables as people waited for me to write a personalized dedication. I could hardly take a lunch! NBC’s primetime television coverage of the 2012 Westminster Dog Show included a one-minute segment about my artwork and my role in the event. It covered the celebratory presentation of my original art to the American Kennel Club Canine Health Foundation, which received a portion of the poster sales to further its mission of preventing, treating and curing canine disease. I was proud to stand with the presenters in the middle of fan-filled Madison Square Garden. An article about my participation in the Westminster Dog Show and the Canine Health Foundation donation also appeared in Today’s Breeder magazine. More of my dog art can be seen at the link below. It was an honor to exhibit my portrait of Ataturk at the American Turkish Council’s 2011 Annual Conference on U.S.-Turkish Relations in Washington, DC. At this three-day event, political, economic and industry leaders gather to discuss and analyze the evolving relationship between the U.S. and Turkey. The agenda is pragmatic and forward-looking, yet historical and cultural dynamics suffuse the debates. The photo here shows my husband talking with retired ambassador to Turkey Alan W. Lukens, whom we thoroughly enjoyed meeting at the event. More of my watercolor, pen and ink illustrations and portraits can be seen at the links below. K.J. Choi was fun to illustrate after he won THE PLAYERS golf tournament on May 15, 2011. Every year when doing the PLAYERS champion’s portrait, I start with a sketch, and then do a portrait of just the winner’s head. The final step is to complete the portrait by adding various vignettes and text. The framed original artwork hangs in the picturesque Sawgrass clubhouse in Ponte Vedra, Florida. Choi’s golf swing is one of my favorites for drawing; he is very elegant. The South Korean flag also adds fine international flair to the composition. Choi's Nashville fans, who have dubbed themselves "Choi’s Bois," are featured in this portrait. Standing behind Choi are other golf stars whom I would love to paint one day. Graeme McDowell, for instance, is the figure in navy blue leaning on his golf clubs. His caddie, in white, has his hand up to his mouth. The endgame gestures and stances of the finalists are intriguing: are these moments of feigned relaxation or genuine repose? More of my PLAYERS portraits can be found at the link below.